La Place Monge. It's a small square in the Latin Quarter, but it's in the middle of a very residential section of central Paris. The quiet square transforms into a bustling market every Wednesday, Friday, and Sunday. I've shopped and wandered around here many times over the years. La Place Monge on a quiet Saturday morning. The place is full of action on market days. I don't know if Mark and Julie made it to see the market. It's hard when you're in a hotel and you really don't have a way to keep food. Everything in Paris markets is so appetizing and I always want to buy more than I need. I don't get the chance to do much shopping in Paris markets these days. But I do remember buying amazing things at the markets and keeping them out on the window sill of our hotel room during our trips, and in our refrigerator when we rented vacation apartments. Monge, and the nearby rue Mouffetard, are great marketplaces and should be a stop on anyone's visit to Paris. Have you been? I had some time to kill before meeting Mark and Julie, so I found a café on the rue Monge near their hotel and sat down. The coffee was rich and good and really hit the spot. After I drank it, I thought to take a photo. My first coffee of the morning. There would be another. The morning was calm, being Saturday, and the air was refreshingly cool compared to the heat of Friday. I lingered for a few minutes, enjoying watching the sun hit the top floors of the buildings around where I sat. People were getting up, opening their shades and windows, letting the sun and the cool morning air into their apartments. The hustle and bustle of the day had yet to begin. It will come as no surprise to you that I like the university campus at Jussieu. Like many bold works of architecture, the campus engendered much controversy. It was never completed as originally planned, but it has been enlarged and renovated since its initial opening in 1971. 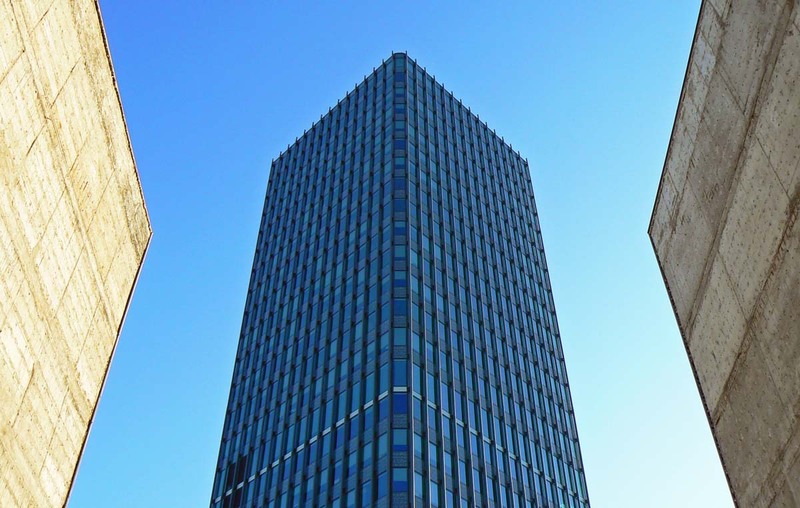 The Zamansky Tower seen from the rue de Jussieu. The centerpiece of the campus is the Zamansky Tower, a twenty-nine floor glass tower that rises elegantly above the grid of the laboratories and classrooms below. Unfortunately, the campus was not very well maintained and it became somewhat of an eyesore; the buildings were covered in ugly graffiti for decades. It was not a particularly inviting place when I lived nearby in 1981. At the end of the 1990s, the university and the education ministry adopted a plan to rehabilitate and modernize the campus. The tower was totally gutted in the early 2000s to remove asbestos while the grid buildings below were cleaned up and completely renovated. From my limited point of view, looking from the outside, the renovation is a success. I don't have any experience of the place from the inside. The campus is built on the site of Paris' old central wine market (1666), which itself was built on the site of the medieval Abbey Saint-Victor de Paris (1109). The abbey was a university of sorts in its time, training young men in arts and sciences and letters, until its decline in the Renaissance. Paris' Fifth Arrondissement, also known as the Latin Quarter. Click to latinate. 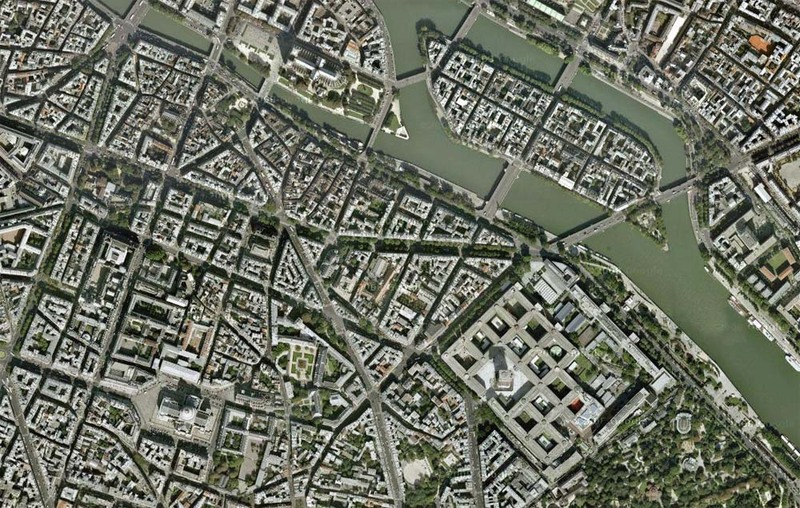 You can see the campus in the screenshot (Google Maps) of the Latin Quarter above. The very distinctive grid of the buildings, with the tower inside, is visible in the lower right of the image. On the lower left, you can see the cross-shaped Panthéon and its dome, and at the top, just left of center, you can see the cathedral of Notre Dame de Paris. Our dinner was fantastic. The setting was nice and the restaurant didn't have a "tourist" feel to it. I know that a lot of tourists go there (me, for example), and we were seated next to a table of Germans (I think), but there were plenty of French people around and it was nice. 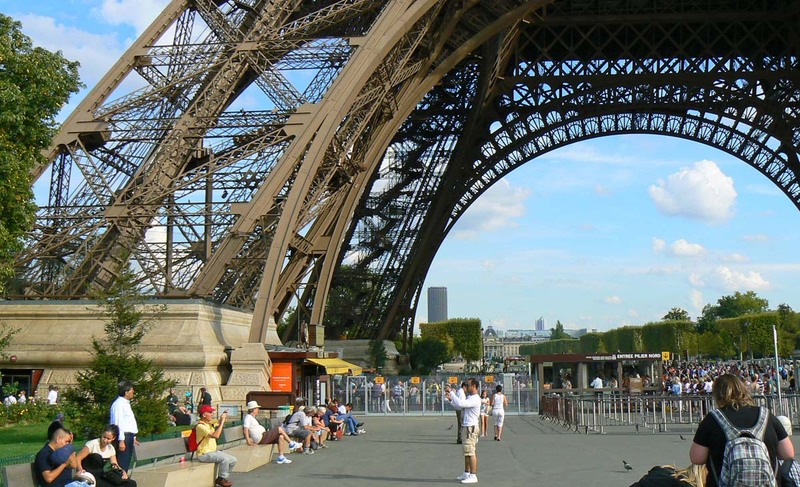 I've been out to eat in Paris on many occasions when I was seated in a sea of fellow American tourists. You might as well eat at Red Lobster. 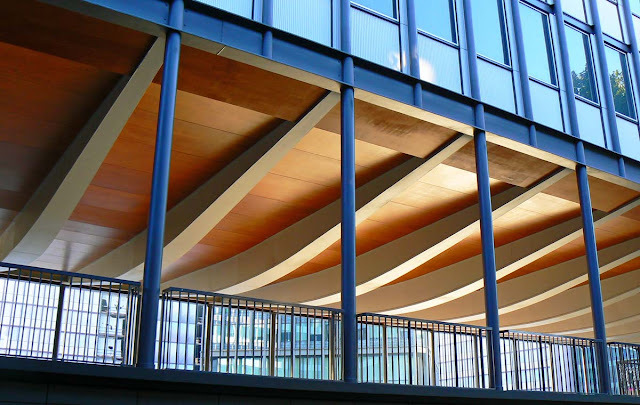 The campus at Jussieu has been recently renovated. I've always really liked the place and it looks fresh and new again. Mark and Julie enjoyed the menu as much as I did. They are adventurous eaters and they enjoy wine. My kind of people. We had two wines from the Loire Valley region (bien sûr) and they were good. The next day we made plans to meet up and go to the modern art museum at the Pompidou Center. I checked out of my hotel and wandered around for a while before meeting them. I walked by the 1960s University of Pierre and Marie Curie campus at Jussieu, next to my hotel, before finding a place to have a cup of coffee. This is the last photo I took on this particular Friday. My walk across Paris was essentially over. 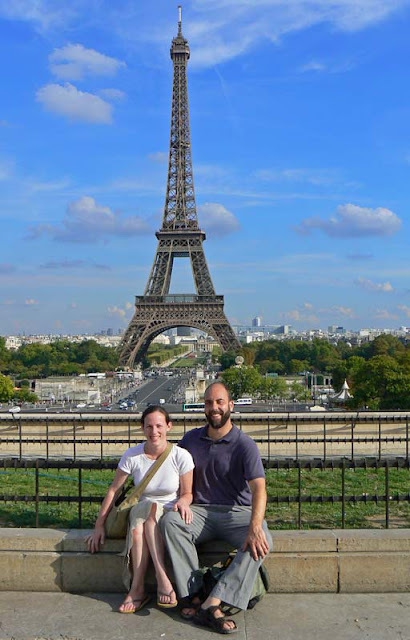 After taking in the views from the Arc de Triomphe, Julie, Mark and I jumped on the subway and zipped back to our hotels on the Left Bank to get ready for dinner. I desperately needed a shower and a change of clothes; it was a very hot day that day. Julie and Mark give their feet a break at the top of the Arc de Triomphe. That's the Avenue Foch stretching out toward the Bois de Boulogne on the left. Dinner was at Le Petit Prince de Paris, not far from our hotels. I had reserved a table a couple of weeks prior and was looking forward to the meal. It didn't disappoint. My main course was carré de porcelet (rack of roast suckling pig), which is one of their signature dishes. Oh, yum! But I didn't take my camera to the restaurant. This is not the greatest photo, but it gives you an idea of what you can see from the Arc de Triomphe. 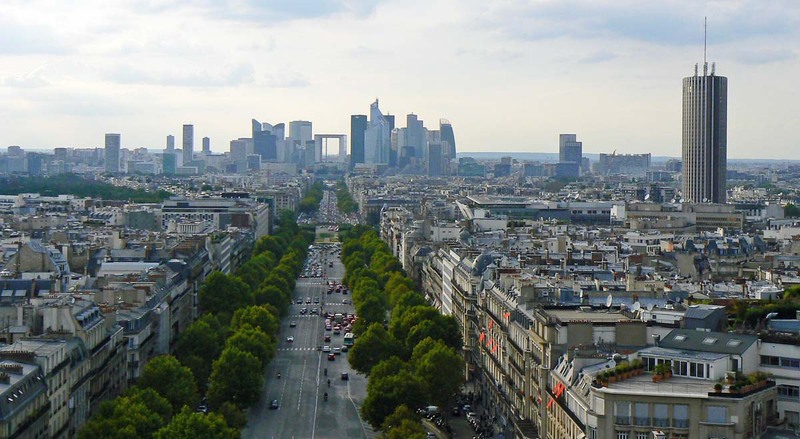 This view is toward the northwest and La Défense, the big business development outside Paris. I'm looking from the Place Charles de Gaulle (l'Etoile) up the Avenue de la Grande Armée. Looking out past Paris, through Neuilly, to La Défense. Click to arcify. I've posted better photos from up here before (see them here), and I didn't take many on this day, so you are spared the panorama this time. And now I present the classic shot of the honeymooners in front of the Eiffel Tower. This is probably one of the most taken photographs in the world. What makes this one exceptional is that it includes Mark and Julie. Aren't they a handsome couple! Of course, I took several photos of them together and of each of them separately, but I liked this one of them together the best. After our photo session, we walked across the Trocadero and up the Avenue Kléber to the Place Charles de Gaulle and the Arc de Triomphe. I remember that my feet were feeling sore at this point. So I went to a kinésithérapeute (similar to a chiropractor) yesterday. We talked a bit about my problem, then he stood me up and started feeling around my neck, chest, and back. He said he didn't think that the problem was with my spine, but with a vertical muscle behind my left pectoral muscle (hey, I've got pecs!) that is tensed and stuck and pinching the nerve that goes into my left arm. He did some massaging and I could feel real relief, albeit temporary. I go back on Thursday morning for another session. I get the impression that there will be multiple sessions during which he will show me what I can do myself to help. When I told him that I had just recently trimmed my hedges, he said to "look no more" for the cause. That was probably it. Repeated horizontal movements (of my arm) can result in this condition, apparently. He was a real nice guy, relaxed and friendly. He has a fish tank in his office and some real low key new age type of music playing. He is pretty much my age. In fact, he said we were born in the same year, although he was born in January and I was born in December. Then he told me that his brother was born in December of the same year. I remarked that that was unusual. He said his parents raised them pretty much as twins. Funny, eh? You've seen both of these before, just not in the same shot. I took this from up on the terrace of the Palais de Chaillot just opposite the Eiffel Tower. 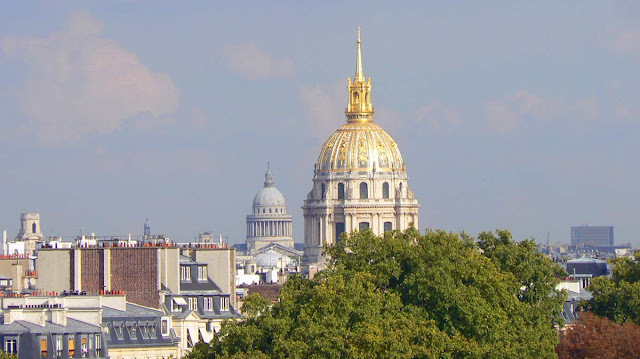 In the background is the dome of the Panthéon, in the foreground is the gilded dome of the Invalides church. On the left you can see one of the bell towers of the St. Sulpice church, and on the right is one of the four modern towers of the François Mitterand Library. Guess where? When we got over to the Eiffel Tower, the line to go up was incredibly long. You can see the people waiting in line on the right hand side, just above the head of the woman with the plaid backpack. We decided not to wait. 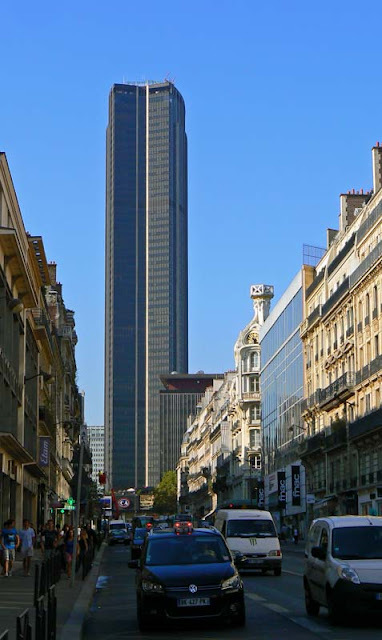 The two tallest structures in Paris: the Eiffel and the Montparnasse towers. I had warned Mark and Julie to be prepared to be accosted by the dozens of men selling trinkets under the tower. If you've been there, you know what I'm talking about. However, when we arrived, there was not a single guy selling tiny towers to be seen. Then I remembered that I had heard a news story about how the police were cracking down on the illegal souvenir peddlers, many of whom are illegal immigrants selling counterfeit products. The only people we saw were fellow tourists. Do you notice the two guys on the bottom of the photo? One is sitting and one is standing... they look like they're taking each other's picture. That's the name of the Rodin sculpture in that's partly visible in this photo. It means "The Three Shadows," although I saw that the English translation on the museum's web site was "The Three Shades." A smaller version of these guys sits atop the Gates of Hell sculpture, which is just behind where I was standing to take this picture. Three guys, three gals. Thanks to Photoshop, I can take the color out of the photo after the fact. This is another one of those photos that I like without really knowing why. I like that the Eiffel Tower is in it, and that conical tree. Then there's that high heel shoe on the bottom. I also like the picture better in black and white than in color. So, given all that, I guess that I do know why I like it. So we left the Rodin museum and walked over toward the Eiffel Tower. Remember, this whole series of Paris photos was taken in less than forty-eight hours. We're only about twenty-four hours in, so there's a lot more to come. 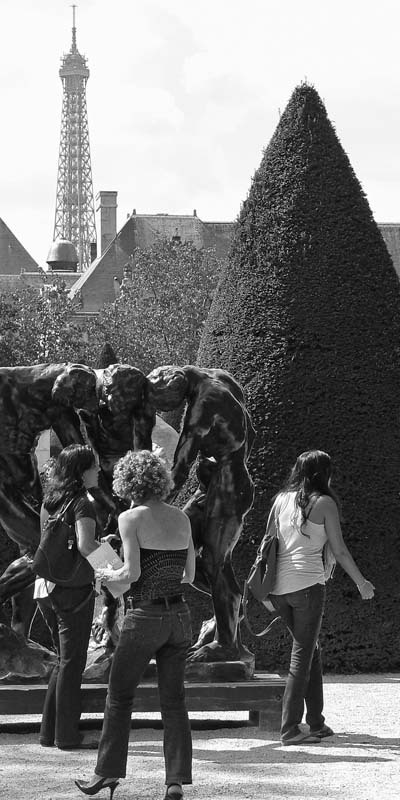 I took advantage of our visit to the Rodin museum to add to a series that I started (unknowingly) thirty years ago. In 1981 I was a "year abroad" student in Paris. 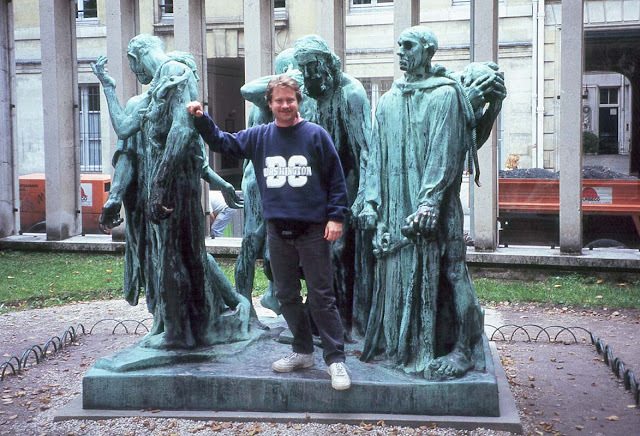 That year I visited the Rodin museum for the first time and someone took my picture hamming it up in front of Rodin's famous statue, The Burghers of Calais. The latest version, September 2011. Thirty years after the first. The original 1895 casting is located in the city of Calais. 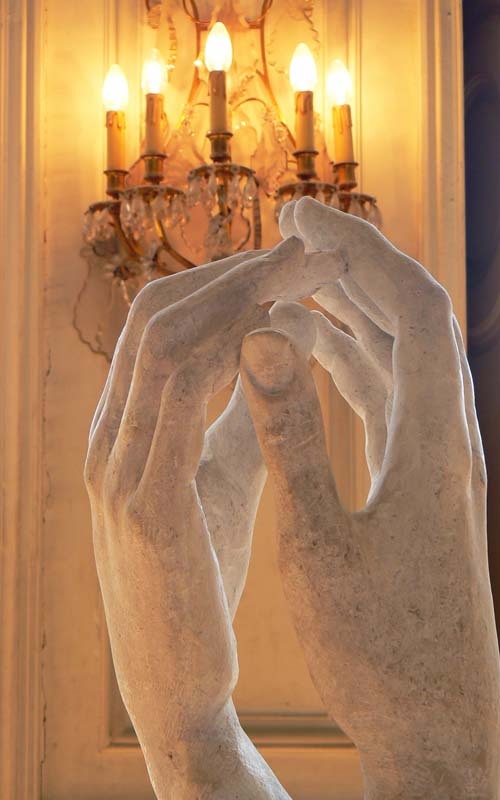 This one, cast in 1926, stands in the garden at the Rodin museum in Paris. Ken and I visited the museum in 1994 and he took a follow-up photo. 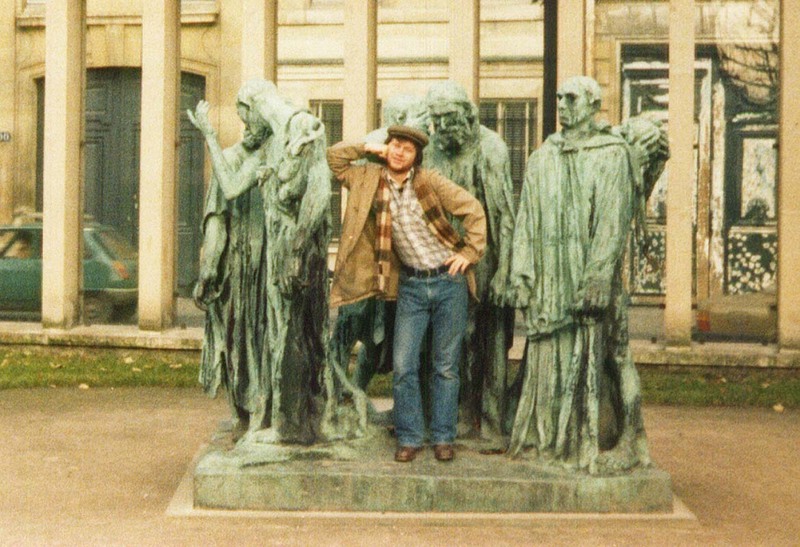 Then, as in 1981, I was able to climb up onto the statue for the photo. The time before that, in 1994. I still wear that sweatshirt. This last time my cousin took the picture. They've since put a little moat filled with water around the statue to keep people (like me) from climbing up onto it (see the top photo). I would have climbed up on the statue anyway, but there was a serious looking guard nearby that might have chewed me out. I didn't want to take any chances of being scolded in French in front of my cousin or, worse, having my camera confiscated, so I stood on the ground in front of the statue like a good boy. Me in 1981, the original "ham" burgher. So there I am, ages 51, 34, and 21. A time span of thirty years. I'm almost as old as those Burghers now. My cousin Mark is pretty laid back, but he doesn't mind hamming it up for the camera. 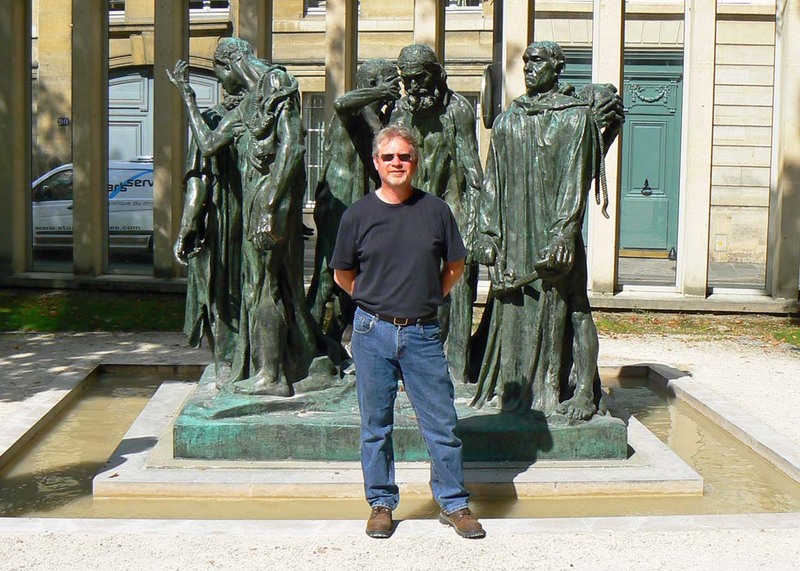 I also hope he won't mind that I've posted this photo, but we had a good laugh in the garden at the Rodin Museum. This was taken next to the very serious statue Le Penseur (The Thinker). What were we thinking? I didn't get the lighting right, but it's still a fun photo. Mark posed for both me and Julie. Hilarity ensued. But we got over it and moved along. You can see below what the same photo looks like without Mark. That's the dome of the Invalides church. You might remember, from a few posts back, that Napoleon's tomb is under that dome. 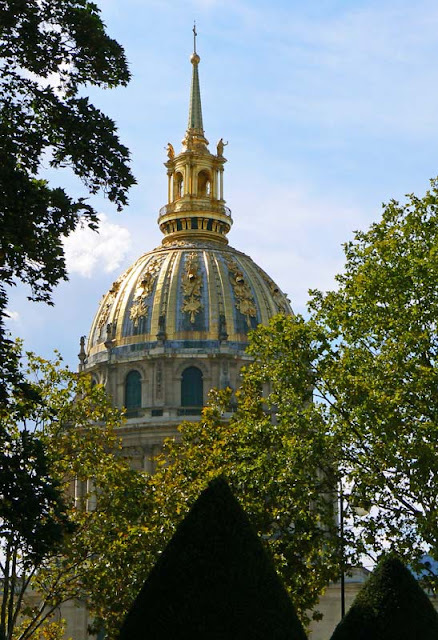 The dome of St.-Louis des Invalides. 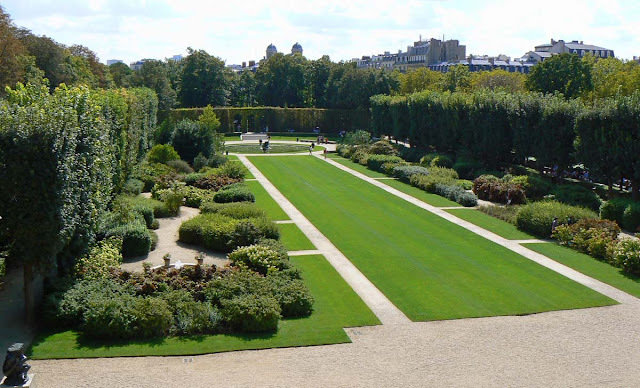 The garden at the Rodin museum is an extension of the museum itself. Placed among the meticulously maintained plants and trees are quite a few of Rodin's sculptures including the famous "Le Penseur" (The Thinker), "La Porte de l'Enfer" (The Gates of Hell), and "Les Bourgeois de Calais" (The Burghers of Calais). 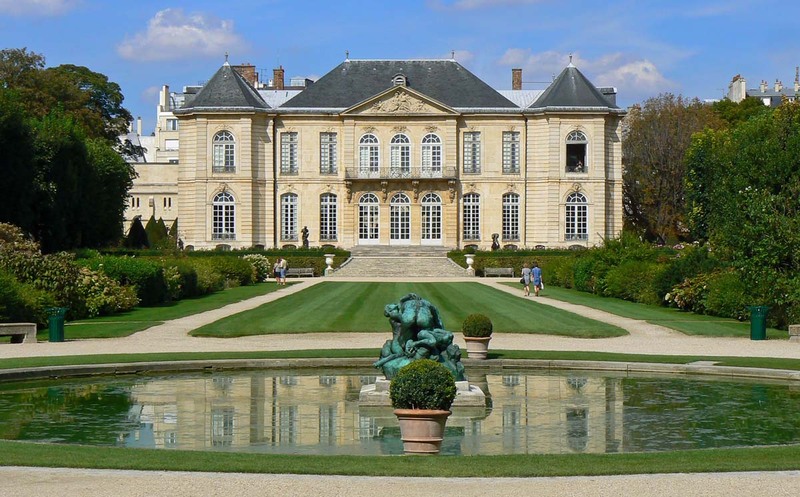 The rear of the Rodin museum and the rear of the statue in the fountain. It's mooning me! The garden includes several little fountains or pools, a large grassy esplanade, and a shady café for light, exorbitantly priced, refreshment. Here and there you can see bits of the city poking up beyond the garden walls, but inside you feel miles away from the hustle and bustle. Looking out over the garden from an open window in the museum. Walking under the shade trees on this day was very pleasant, as the temperature was nearly as high as the sun. There were a few people around, but the crowds of summer seemed to have diminished. We were lucky. Part of the fun of the Rodin museum, at least for me, is wandering around in the building itself. The wooden floors creak. The woodwork and moldings on the walls and ceilings are art in and of themselves. And almost every room has a different old fireplace. 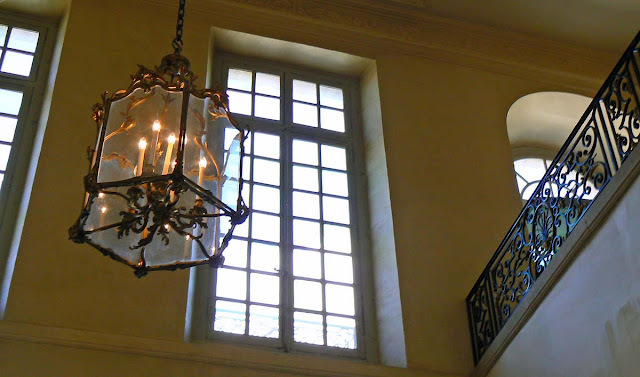 The stairwell of the Hotel Biron, more popularly known as the Rodin museum. Click to escalate. This is the stairwell from the building entrance up to the first floor exhibition space. The light fixture is typical of the fixtures throughout the museum. I like the photo, but I'm hard-pressed to say exactly why. Maybe it's all the angles? The contrast between the light outside and inside? The juxtaposition of the delicate metal works and the sheer bulk of the walls? Discuss. That's the name of this sculpture by Auguste Rodin, completed in 1909. The museum is filled with incredible works, mostly sculpture in stone, marble, and bronze, along with some drawings and works by other artists. I didn't photograph many of them, but this one looked pretty cool in its setting. I had no idea how famous this sculpture is. Mark and Julie and I wandered around inside the building for a while before heading out to the garden which is also filled with sculptures. Many of the windows in the old mansion were thrown open to catch what little breeze there was. It was a sultry day. The Concorde Bridge connects the Place de la Concorde on the Right Bank to the Assemblée Nationale (the lower house of the French legislature) on the Left Bank. About a block away from the Assembly building is the entrance to the métro station I was headed for. Here's my train! At the Assemblée Nationale station. It wasn't long before I arrived at my hotel and picked up my back-up camera battery. 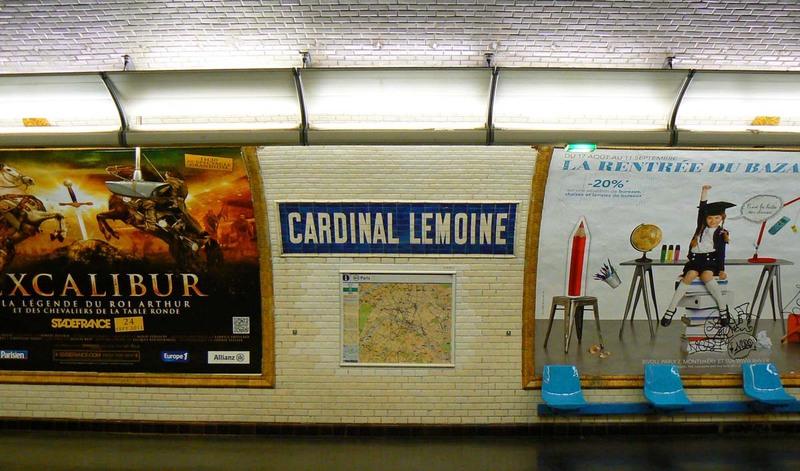 I was back on the platform at the Cardinal Lemoine station in no time, ready to head back over the Rodin museum to meet my cousin and his wife. I had seven stops, a transfer, then two more stops. I made it more or less on time. Waiting for the train at the Cardinal Lemoine station next to my hotel. Mark and Julie were already there, browsing around in the museum gift shop. There was practically no line at the entrance and I paid my for my ticket and we were in. The museum is in the Hotel Biron, an eighteenth century mansion with an extensive garden in the middle of Paris. The building was in a sad state of repair when Rodin occupied it in the early 1900s. The national government bought and renovated the building after Rodin bequeathed his works to the people of France, stipulating that a museum be built around his collection at the site. 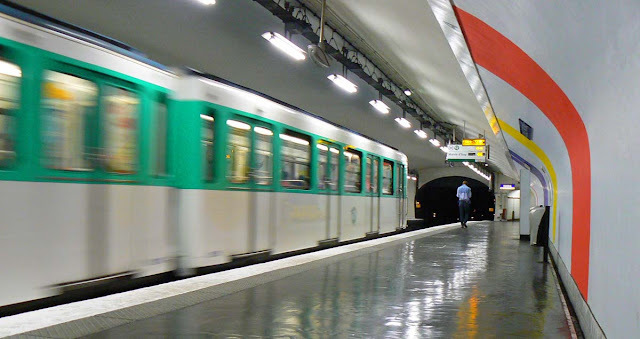 To get back to my hotel quickly, I chose the Assemblée Nationale metro station. Three stops, a transfer, and then five stops would get me there. I crossed the river at Concorde and this was my view. Tour boats ply the river in central Paris. Click on the picture to pontify. The first bridge you see above is one of the newest in Paris. It's a pedestrian bridge completed in 1999, replacing an older bridge that was damaged. The new bridge is actually called la Passerelle Léopold-Sédar-Senghor, but I still call it Solférino. I'll bet most Parisians do, too. You can see a trio of significant Paris buildings in today's photo. First, on the left, is the spire of the Sainte Chapelle, a gothic chapel built in the middle of the thirteenth century. Next, in the middle, the twin bell towers and spire of the Cathedral of Notre Dame de Paris. Both of those buildings are on the Ile de la Cité. Finally, on the right (which is the Left Bank), the dome of the Institut de France, meeting place of the famous Académie française. 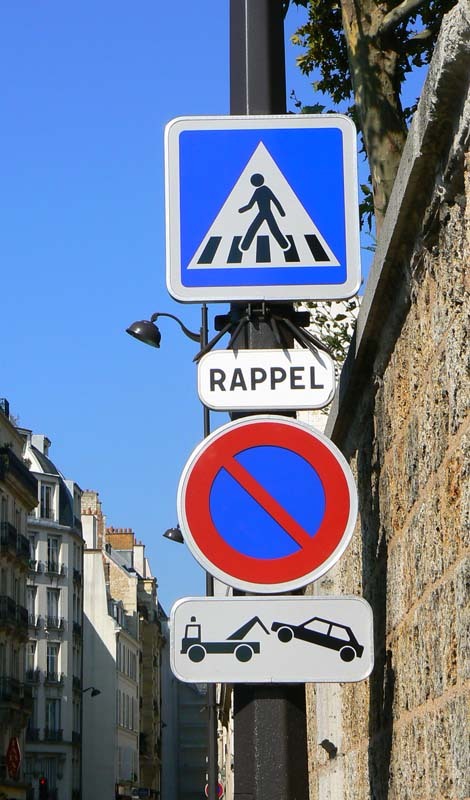 There are a few places in Paris that can make you a bit nervous if you're driving a car. This is one of them: Place de la Concorde. This is the place where King Louis XVI lost his head. I suppose he got cut off. Rim shot. The center of the Place de la Concorde. Click to concordinate. In the center of the place is l'obélisque, a gift to France from Egypt in 1836. It is one of a pair of obelisks originally placed together in the city of Luxor and is well over three thousand years old. In its current setting, it supposedly serves as a sundial with lines marked in the pavement around it; I've never noticed the lines. 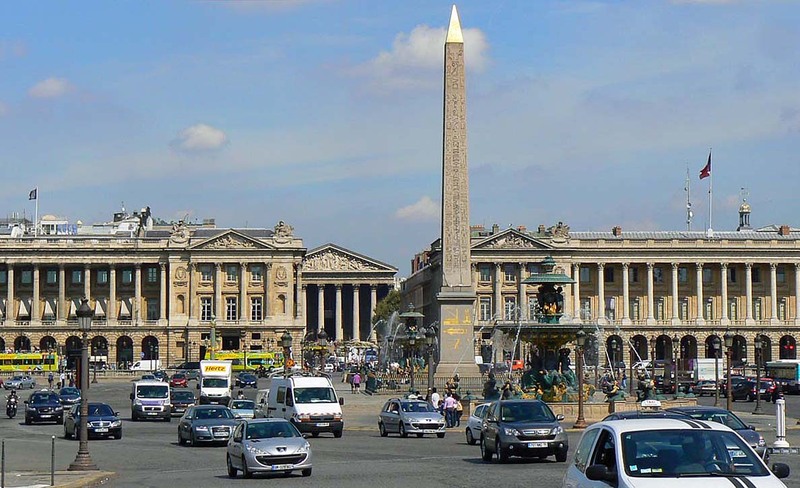 The obelisk is flanked by two large fountains: the Fountain of the Seas and the Fountain of the Rivers, each meant to celebrate France's naval prowess. If you're brave enough to make your way on foot to the middle of the place, you can see engravings on the base of the obelisk that depict its transport from Egypt to France. 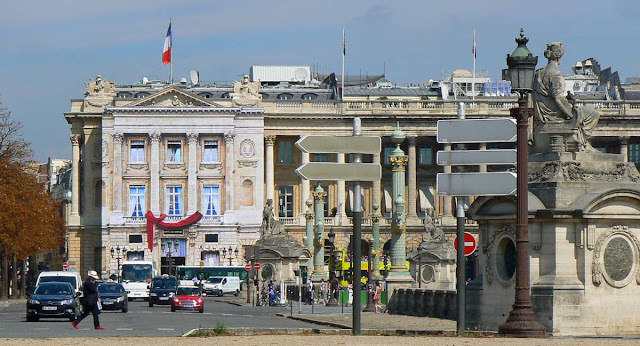 The two impressive buildings on either side of this picture are, on the left, the Hotel de Crillon, a classy high-end hotel, and on the right, the headquarters of the French Navy. Between them, at the top of the rue Royale, you can see the classical façade of the Madeleine Church. 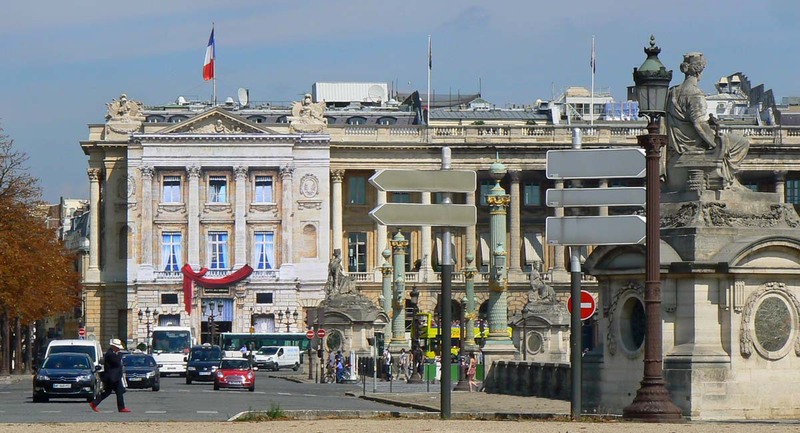 The Hotel de Crillon is getting a face lift. That façade on the left (with the red ribbon) is actually a painting on the screens that hide the workmen's scaffolding. Just to the left, out of the photo, is the Embassy of the United States. About a half-hour before I was to meet Mark and Julie at the Rodin museum, I noticed that my camera battery was losing power. My second battery was back at the hotel room. I decided I had enough time to get to a subway station, go to the hotel and get the battery, then take the subway back to the museum. I was on my way to the subway when I took these photos. Marquis de La Fayette. 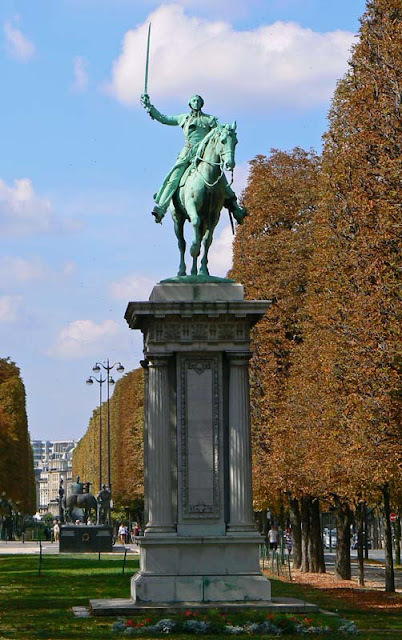 One of the countless statues honoring this French hero of the American Revolution stands in the Cours de la Reine on Paris' right bank. It's a life-size (maybe bigger) equestrian statue on a very tall pedestal. The Marquis de La Fayette in Paris. The Marquis de La Fayette visited all of the states of the new American nation before his death in 1834. In 1778, during the Revolutionary War, he came to my home town of Albany, New York, to lead a proposed invasion of Canada. The invasion never took place, partly because La Fayette had concerns about troop numbers and the logistics of the invasion. While in Albany, La Fayette stayed at a house called Cherry Hill, which is still standing and operates as a historical museum. I remember going there as an elementary school student and seeing an exhibit that included a pair of La Fayette's silk stockings, apparently left behind after his visit. A downtown park in Albany, located next to the state capitol, is named for the Marquis. Lafayette Park and Historic District include the park itself and many of the surrounding buildings. In the US, I've seen the Marquis' name spelled with a space (La Fayette), with no space and a capital "F" (LaFayette), and with no space and a small "f" (Lafayette) . That's what my friend and frequent commenter CHM calls them. It means "the ugly boats" and is a play on their actual name, les Bateaux-Mouches. The name (literally "fly boats") is derived from the neighborhood in Lyon (le quartier de la Mouche) where a certain number of the boats were built as passenger transports for the Paris Universal Exposition in 1867. The upper deck of the bateau-mouche "l'Hirondelle." The lower deck is usually glassed in and heated in cold weather. 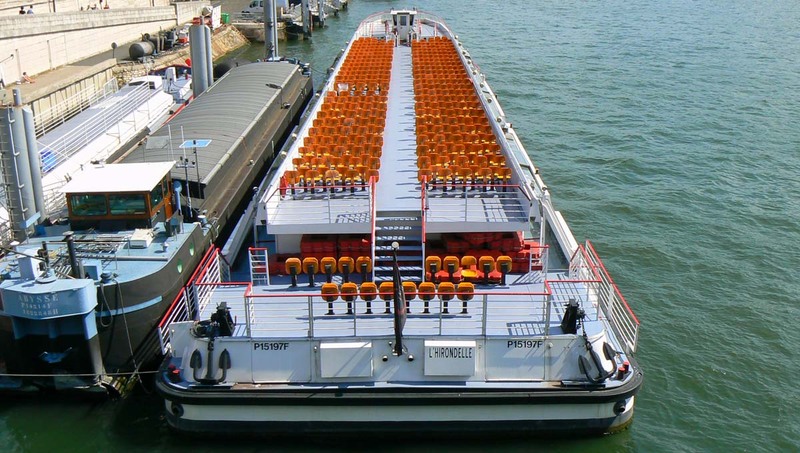 This particular style of boat was used since earlier in the nineteenth century to transport freight or passengers along rivers and canals in France, but it wasn't until about 1950 that one of those boats built for the 1867 expo was used in a new venture: taking people on pleasure cruises up and down the Seine. The name "bateaux-mouches" was registered as a trademark and the business thrived, as it does today. The sign above the ticket office. I've taken these cruises a few times over the years. They're really nice, day or night, especially when it's warm and you can be outside on the upper deck. There are all kinds of cruises available these days, including dinner cruises. There are also several other companies that offer similar cruises on the river, but I think the Bateaux-Mouches is the most well known. 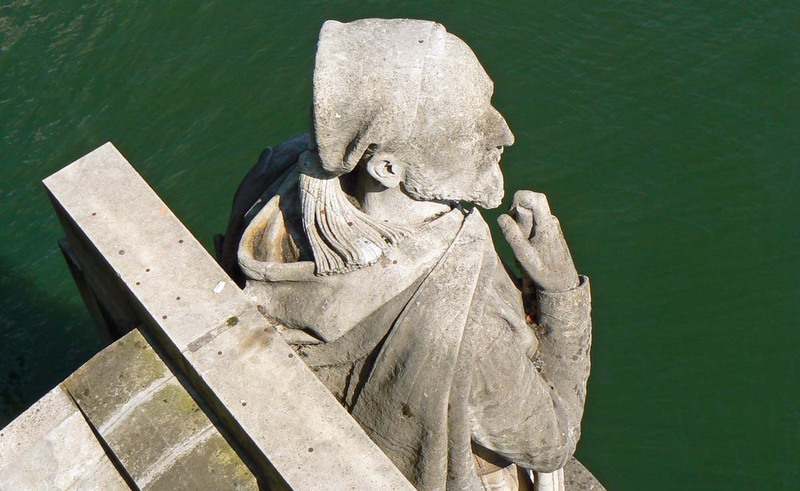 This statue adorns the upstream end of one of the pillars (close to the right bank) on the Alma Bridge over the Seine in Paris. It is the only one remaining of the original four military statues on the bridge and depicts a zouave soldier of the Crimean War in his battle garb. Looking down on the zouave. He's wearing a fez, and his feet are dry. The zouaves were infantry units in the French African Army whose first campaign was the conquest of Algeria in the nineteenth century. They were active in many battles and wars beyond north Africa until 1962; their units were dissolved when Algeria gained its independence from France. The peculiarity of this particular statue is that it was once a measure of the Seine's flooding. When the zouave had les pieds au sec (dry feet), the Seine was below flood stage and all was normal. If the zouave had les pieds dans l'eau (it's feet in the water), the Seine was at flood stage and the roadways, parking lots, and walkways at water level were inundated. When the river's level got up to the zouave's thighs, boats could no longer navigate (they couldn't get under the bridges). During the historic flood of 1910, the water rose up to the zouave's shoulders. 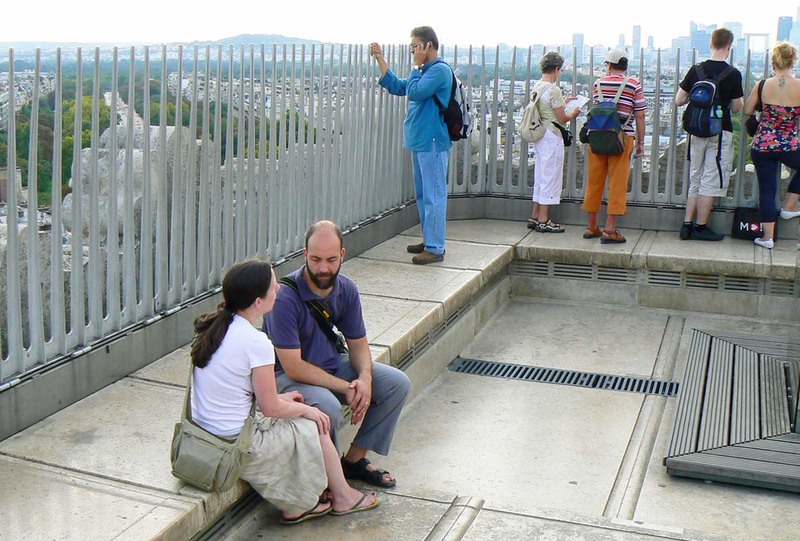 Parisians looked to the zouave during periods of high water until the early 1970s, when the bridge was reconstructed with only one pillar actually in the water. The three companion statues (a foot soldier, a grenadier, and an artillery man) were removed from the bridge and located elsewhere. The zouave remained on the bridge, but was moved and placed higher up than it was originally. This view of the Seine is looking up river from the Pont de l'Alma. There is kind of an optical illusion going on here: the bridge you can see spanning the river is the Pont des Invalides, but just beyond it is another bridge with gold statues at either end. That's the Pont Alexandre III. In this photo you might mistake them for one bridge. Looking up the Seine toward the Louvre, part of which is visible on the right. Click to fleuvinate. On the left, at water level, you can see the departure point for the famous Bateaux Mouches, the tour boats that cruise up and down the river daily. After dark, the boats' bright lights illuminate the buildings on either side of the river. 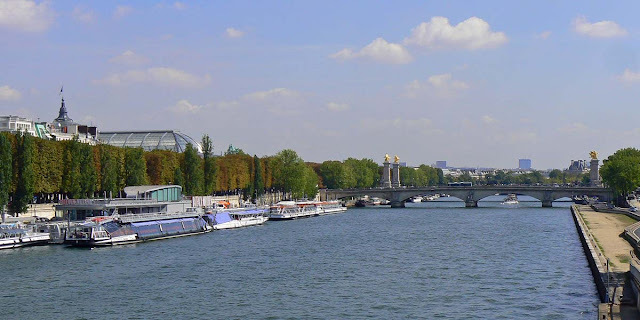 Also on the left (which is the Right Bank because it's on your right-hand side as you look down river), you can see the recently renovated glass roof of the Grand Palais, a museum and exhibition hall built for the Universal Exposition of 1900. 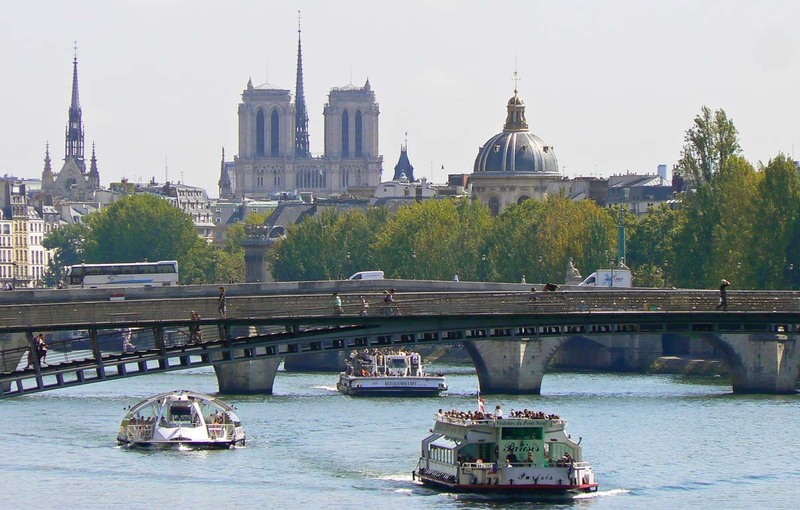 The Seine is classified as une fleuve in French, which means that it's a river that runs into the sea. Other principal French fleuves include the Loire (the longest in France), the Rhône, and the Garonne. Rivers that are tributaries to other rivers are called rivières. We live on the Cher, which is une rivière because it's a tributary of the Loire. After my refreshing drink, I headed out again to look for some lunch. I walked along the rue Saint Dominique looking at restaurant menus, but nothing spoke to me. Until I got to the end of the street. There was an old favorite: le Champ de Mars, a great café very close to the Eiffel Tower. The terrace was sunny and the umbrellas were out. I sat down. 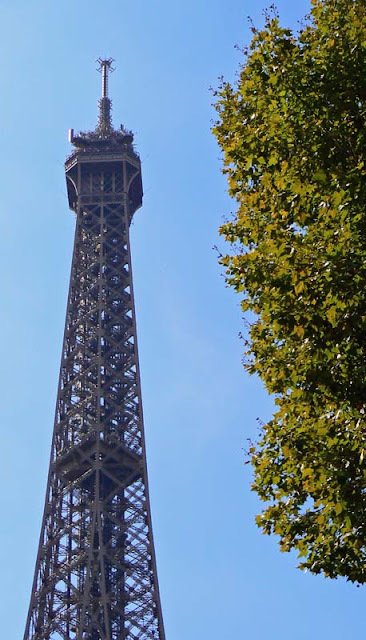 The Eiffel Tower seen from the Avenue Rapp. Lunch was a big mixed salad and some nicely chilled white wine. Yum. After lunch I still had time for more walking before meeting my cousin Mark and Julie at the Rodin museum. I decided to head up to the river on the Avenue Rapp and walk back toward the Esplanade des Invalides. On my way I was treated to glimpses of the tower rising up above the buildings. 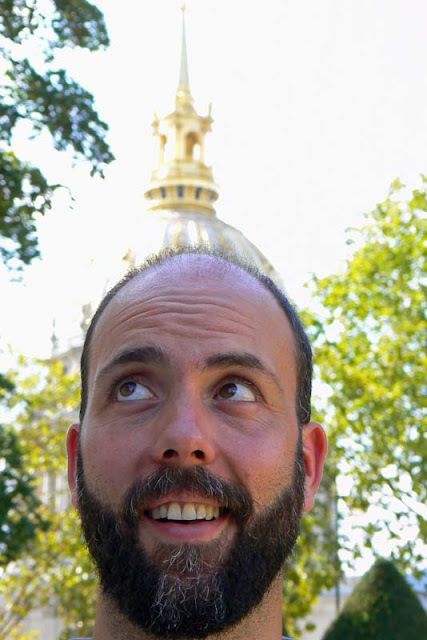 I started my walk earlier in the morning over in the fifth arrondissement and now I found myself in the heart of the seventh, a healthy four kilometers (about two and a half miles) from my starting point. The day was turning hot and I was thirsty. I made my way through the rue St. Dominique to a café I know on the boulevard de la Tour Maubourg. The pause that refreshes. Ahhhhhh. 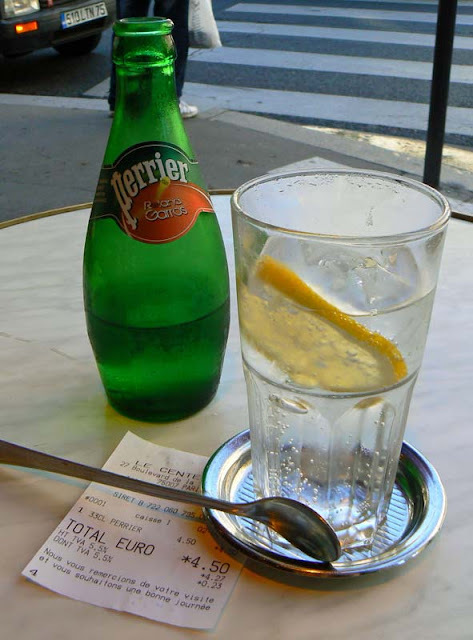 A Perrier with a slice of lemon really hit the spot. It also hit my wallet pretty hard at €4.50 for the little bottle. But it didn't matter. I spent about a half-hour resting, sipping, and watching people go by. We're back now from a five day jaunt up to Champagne. We were supposed to have wi-fi in the rental house, but of course, didn't. So we were without internet for a while and made no special efforts to connect (there might have been hot spots around, but it was too much trouble to take the laptop and go looking for them, so we did without). I'm working (slowly) on responding to comments from the last few days. Everything is expensive in big cities. Paris is no exception to this rule. I wandered up the rue Cler just to have a look (actually, I wanted to check out a store where we once bought kitchen towels). Being kind of a market street, there were many boutiques open with their food on display. All three of these cheeses are made with goat's milk. Click to chevrenate. This fromager (cheese merchant) had a big case of cheeses out on the sidewalk, but this window display caught my attention. These are goat cheeses from the region I live in. But these are certainly not the prices we pay here, where the cheese is local. 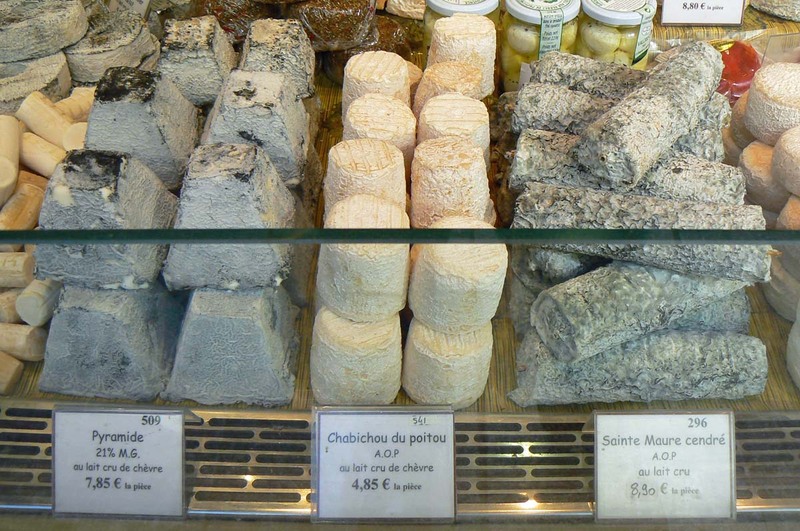 The three cheeses labeled in the picture are, from left to right, a pyramid made in the Valençay style (but without the A.O.C. name), a chabichou from the nearby Poitou region, and a Saint-Maure-de-Touraine, a log-shaped cheese that has a straw through the middle to keep it from breaking when handled. These cheeses are being sold in Paris for easily twice what we get them for here, maybe a little more. And he's buried under this dome. At least, his ashes are inside a huge (and I mean huge) marble quartzite sarcophagus in the center of this church, directly under the dome. 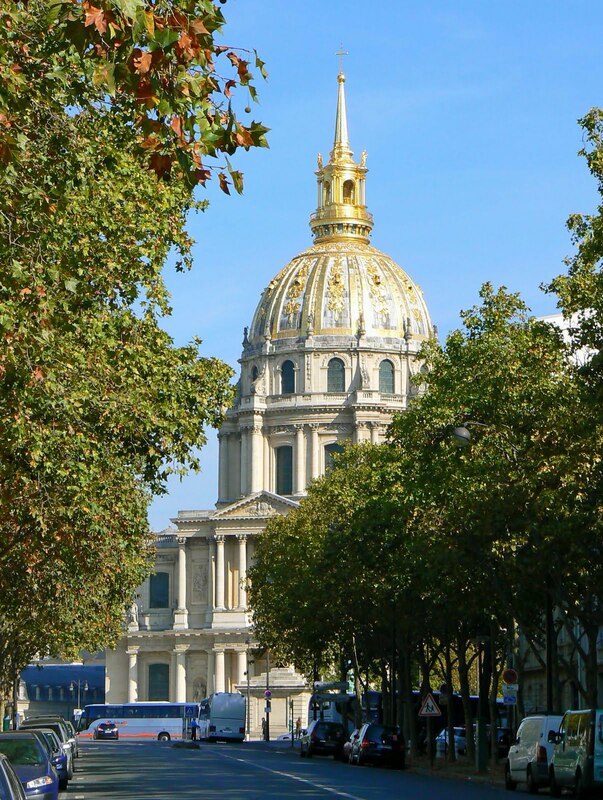 The church is officially called the Cathédrale Saint-Louis-des-Invalides, and is open to the public. Le Dôme des Invalides seen from the Avenue de Villars. I've only been inside the cathedral once (to see the tomb), but since then I've been into the Invalides complex a couple of times. There is military museum there as well as museum dedicated to historic plans-reliefs, an amazing collection of models of battlefields, forts, and strategic towns, mostly built in between the seventeenth and nineteenth centuries. It's very cool. In the view above, you see the dome over the crypt. This is the rear of the church and it's physically separated from the nave which is on the other side, to the north. I think that the nave was called l'Eglise des soldats (the soldiers' or veterans' church) and the dome section was called l'Eglise du dôme (church of the dome). The two churches together were elevated to cathedral status at some point after their construction, but I can't find any specific information about that. I took a lot of pictures of this dome from various places in the city, so you'll see it again before this series is over. Ya think? I certainly wouldn't park here. All these signs look pretty new. I wonder if there's been a parking problem on this street (it's still the rue de Babylone). 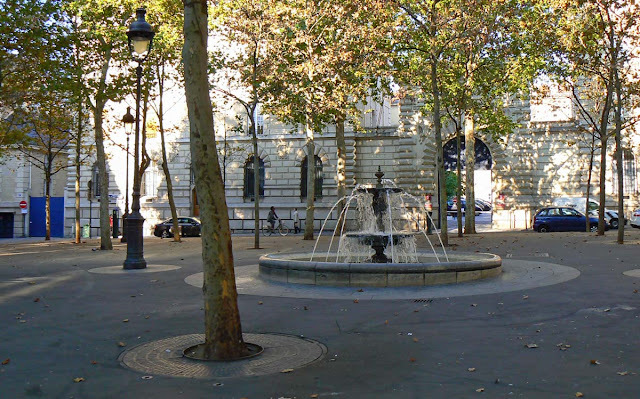 Something that always fascinated me about Paris was that in most neighborhoods, often twice a day, water will start flowing out of a spigot in the curb and run along to the nearest drain. There is sometimes a city worker sweeping along the stream of water, and in some places the worker will lay a rolled up towel in the street to change the direction of the flow. This is how the street gutters are cleaned. Flushing the gutters in the rue de Bablyone. In the neighborhood where I lived, this happened twice a day; once in the morning and again in the evening. They guys, often of North African origin, had long straw brooms that looked like the typical witch's broom. Over the years those straw brooms were traded out for green plastic brooms, but they serve the same purpose of cleaning the street gutters. There are more modern techniques for sidewalk and street cleaning around the city these days. Amazing green machines that vacuum and wash the pavements are driven around all over. 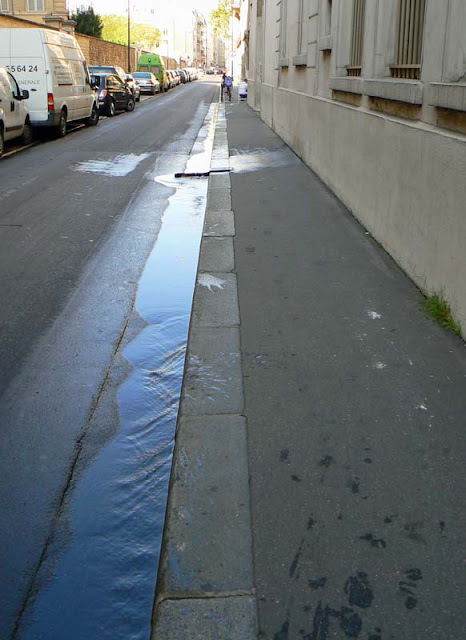 But the water still runs in the gutters, just like in this picture of the rue de Babylone. 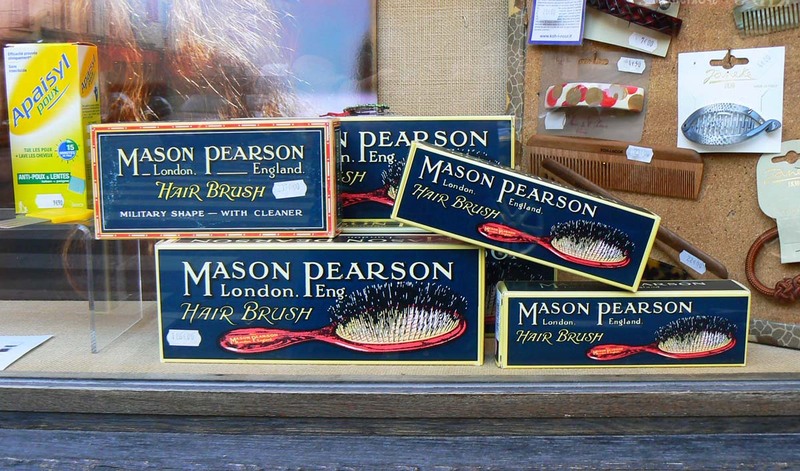 I saw these stacked in a hair care store on the rue du Bac. 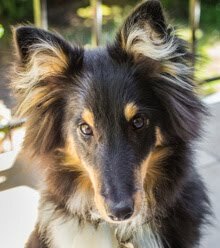 Are English hair brushes sought after? Chic? Well made? I have no idea. But the display certainly caught my eye. Pay no attention to the lice treatment solution on the left. Store window displays in Paris are often very artsy (this one being the exception), even in the smallest boutiques. More than a sign, the display will entice you to enter the shop. In the old days, people did not go into most shops to browse. The spaces are often too small. One only entered a shop with the intent to buy. Most of the time, nearly everything a shop sold was displayed in the window, along with prices. These days that is mostly all changed. Global tourism and shopping-as-recreation have had an impact on many stores and boutiques in Paris. 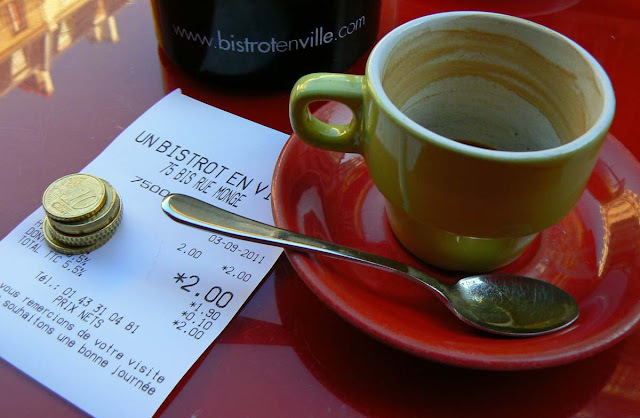 Nowadays you will often see the sign "entrée libre" (enter freely) on shops inviting customers to walk in and browse. No purchase necessary. Of course, it is still expected that you greet the staff and other customers with a "bonjour" as you enter and a "merci, au revior" as you exit. It's only polite. One of my readers referred to this tower as a monstrosity. Everyone is entitled to his opinion, of course. I know I'm in the minority. I like the Tour Montparnasse. And this is one of my favorite views of it: looking up the rue de Rennes directly toward the tower. What a beautiful view! Click to Montparnassify. I know it's not everyone's cup of tea. But I've never known Paris without this tower. It's part of the cityscape. It's hard for me to imagine Paris without it. 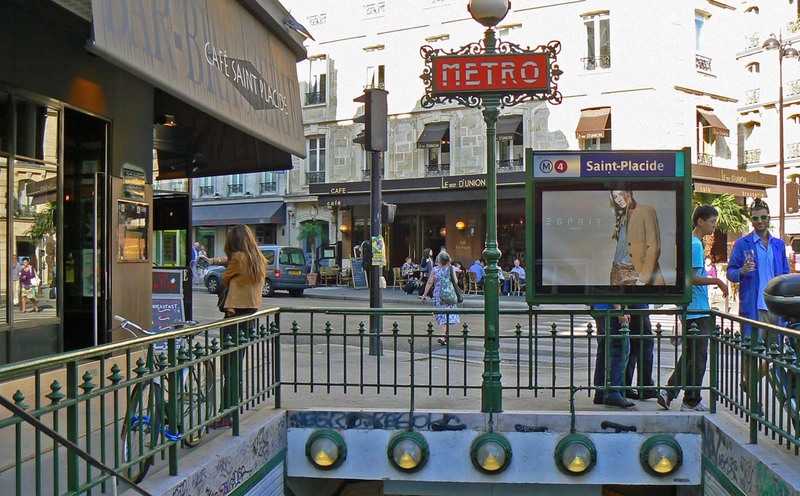 The closest métro stop to our language school was Saint-Placide on the rue de Rennes. On days when it was raining or too cold to walk to school, I could duck into the subway near the pension and ride two stops to this station, then walk the couple of blocks to school. The title of this post refers to the guy on the right in the photo. I also like how the woman on the left almost looks like the woman in the ad poster. Click to metronate. You can see the Café Saint Placide on the left which is also a news stand and smoke shop. It gets lots of traffic since it's right next to the station exit. I used to buy cigarettes there; I smoked when I lived in Paris. Across the street is the Trait d'Union café. Thirty years ago that was a traditional French café, but it's been recently updated and is now a very "hip" drinking establishment complete with video screens, trendy music, and plush sofas. You can't stop progress. Just behind where I'm standing to take this picture was a great little bakery, and it's still there. 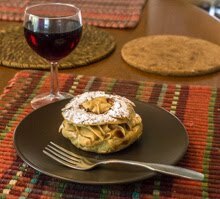 I used to buy one of my favorite pastries there, a mille-feuille (a Napoleon), on my way home from class.